Mail Online article- Why you shouldn’t try to be a hero when helping people in danger. 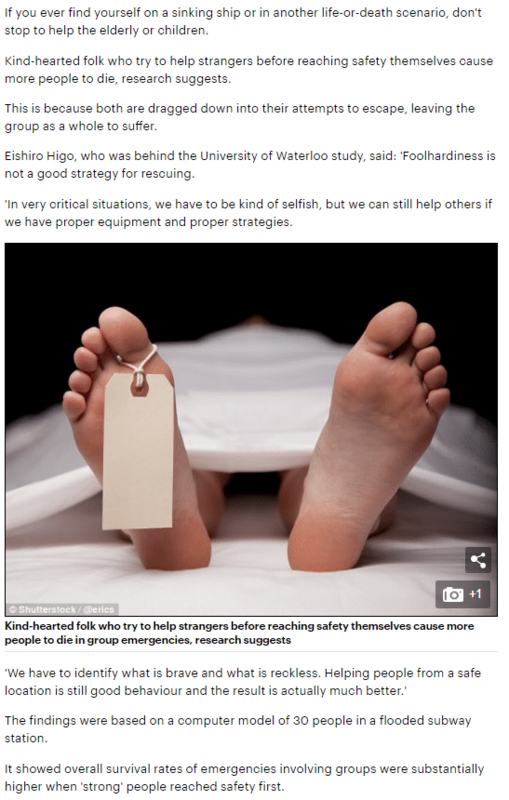 New research by University of Waterloo suggests that sometimes helping people in danger doesn’t always save lives. It can actually cause more problems. This can happen when the person trying to help the victim is putting themselves in danger by trying to save the victim’s life. Occasionally resulting in the person trying to help getting injured as well. Emma Hammett, of First Aid For Life, explains why it is essential to make sure you’re safe first when you’re trying to help others in danger. Emma also gives expertise on how to determine the severity of the victim’s injury by their behaviour. For example, if they are making noises in pain or if they are not. This is essential knowledge to have if you encounter a situation where a person is in need of medical attention. When helping someone, we have to work out what is brave and what is reckless. Studies conducted by Japanese researchers showed that if people were more selfish, less people would die. This is because the people would save themselves first and then help others in danger. In the end causing a lot less deaths. 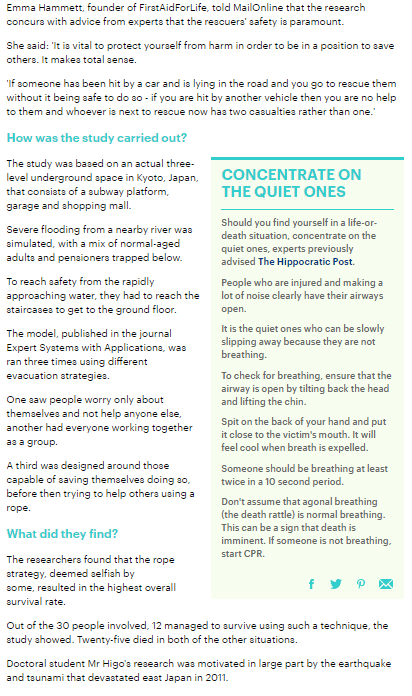 Helping people when you’re not in danger is really helpful and the result is much better. Otherwise even though it may seem like you are doing a heroic deed by trying to save a life. If the location is unsafe, you could end up hurting yourself too and cause more casualties. Only try to help people if you know that you won’t injure yourself too.